For Canada's 150th anniversary, the Art Gallery of Ontario features "Fire and Light," a retrospective of the abstract paintings of octogenarian master Rita Letendre. Letendre has a tendency towards painting diagonal lines that bar entry into her pictures like No Smoking signs. However, when the angled marks lean closer to horizontal or vertical stability, the pictures vibrate with powerful optical presence. Though superficially similar to color-field paintings by her American counterparts, Letendre's work is more an extension of Rothko's tragedy, ecstasy, and doom than a post-painterly refutation of such gravitas. 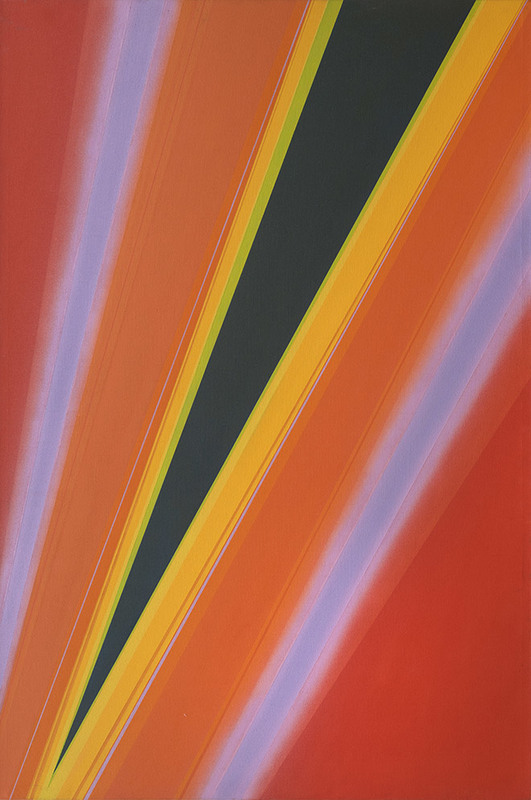 Works from the 1970s and '80s combine hard-edge painting with atmospheric sprays. Clouds of paint simultaneously project out of the canvas and recede into the picture while stripes rest matter-of-factly on the surface, a curious combination of Hans Hofmann's push/pull with Jules Olitski's atmospheric grandeur. Letendre both follows the light and carries the torch.